Arizona Periodontal Group is an advanced and well-reviewed dental practice in Phoenix, AZ, specializing in periodontal treatments. Our doctor is Dr. Ariel Trujillo, periodontist. Both have earned recognition in their fields for their quality work and experience. Arizona Periodontal Group offers state-of-the-art technology and techniques that guarantee we can provide you with the most advanced treatments available no matter how unique your situation might be. Dr. Trujillo and the rest of their staff are highly trained with years of experience behind them. They recognize that dental technologies are always changing, and that staying abreast of advances in technology is vital to maintaining a great dental practice. 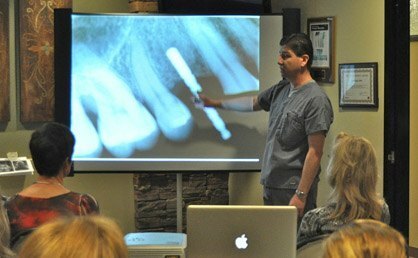 For this reason, the team at Arizona Periodontal Group continues to attend dental conventions and conferences that provide us with the latest in dental equipment and techniques. When you arrive for your scheduled appointment, you can be confident that you’re getting the best treatment that modern dentistry has to offer. Our staff is well equipped and trained to treat any dental malady from gum disease to replacing a missing tooth with a dental implant, but also we’re true believers that an ounce of prevention is worth over a pound of cure. Providing quality preventive care, and educating our patients on how to care for their teeth effectively is our top priority. It’s the key to optimal dental health, and vital to maintaining the greatest quality of life. Because dental health issues do sometimes arise despite everyone's best efforts, corrective dental treatment can become necessary for most people at some point in their lives. In these situations, also, we want you to be educated and to remain an active part of the decision-making process. It is important to us that you understand all the options available to you, the pros and cons of each, and the implications for your dental health in the future. They’re your teeth—what happens to them should be your decision. It’s obvious that trust and communication between doctor and patient are vital to a good experience at the dentist’s office. That’s why we are proud of the fact that we are equipped to serve Spanish-speaking patients as well as those who speak English. Dr. Trujillo is bilingual, and is happy to serve the many Spanish speakers in the Phoenix area. Few people enjoy visiting the dentist—but we’re working hard to change that! We are dedicated to treating you as an individual not just a name on a chart. We strive to giving you all the information you need to make an informed decision for your dental health. Our patients overwhelmingly report feeling at ease in our office and satisfied with the treatments they recieve. So whether you’re in need of a scheduled cleaning, have been considering dental implants, or you’re looking for a great periodontist in Phoenix; Arizona Periodontal Group can take care of you. Contact us today and let us show you what a great experience at the dentist’s office feels like!